Is Hydrogen the Best of the Green Fuels? Currently, the U.S. and most of the world is in what would be called the fossil fuel economy. The majority of our power source is from oil, natural gas, coal, and petroleum products. We need energy to keep our world and society running; however, fossil fuel energy also creates problems such as pollution, climate change and imported oil dependence. The large market and sharply rising prices in fossil fuels have stimulated great interest in alternate, cheaper means of hydrogen production. A recent ExxonMobil (NYSE:XOM) ad introduces the concept of an on-board fuel reformer for vehicles. These devices combine water and oil (or another feedstock) to produce hydrogen fuel for the vehicle. The energy source needed may be in the form of wind, oil, nuclear as well concentrated solar thermal. Moreover, hydrogen has been identified as a key future fuel for low carbon energy systems such as power generation in fuel cells and as a transport fuel. The estimated costs for producing and delivering hydrogen to the fueling station using today’s technologies vary from $2.10/gallon of gasoline equivalent (gge) to $9.10/gge, before taxes. According to a National Academy of Engineering 2004 estimate, projected costs using future technology if current R&D efforts are successful would reduce the cost of hydrogen to the range between $1.75/gge to $4.25/gge. Thus hydrogen is expected to be competitive with gasoline per mile driven. In a pure hydrogen economy, the hydrogen must be derived from renewable sources rather than fossil fuels so that we stop releasing carbon into the atmosphere. While it’s likely to be many years before a pure hydrogen economy can be achieved due to infrastructure and storage issues, a mixed hydrogen economy scenario, where all energy sources coexist to produce a single form of fuel, could be a forerunner to this as sustainable, and more environmentally friendly. This mixed hydrogen economy scenario has the benefit of reducing not only pollution, but also greenhouse gas and oil dependence. In addition, hydrogen is the only fuel which can be produced by essentially the same process from a variety of domestically available feedstocks such as oil (petroleum), vegetable oil, biomass, alcohol, natural gas, and biodiesel. Even sugar and coal become players in the transportation fuel sector in this scenario. Having this variety of choices when you make hydrogen is part of what makes hydrogen a universal fuel. The transition to hydrogen fuel produced from multiple feedstocks would create a near perfect competition in the vehicle fuel sector. Producers would have to compete for market share as hydrogen becomes a generic commodity. This could also drive the R&D of new technologies as producers strive to stay cost and product competitive. In addition, we will have a more distributed production network since hydrogen can be produced anywhere that you have electricity and water. 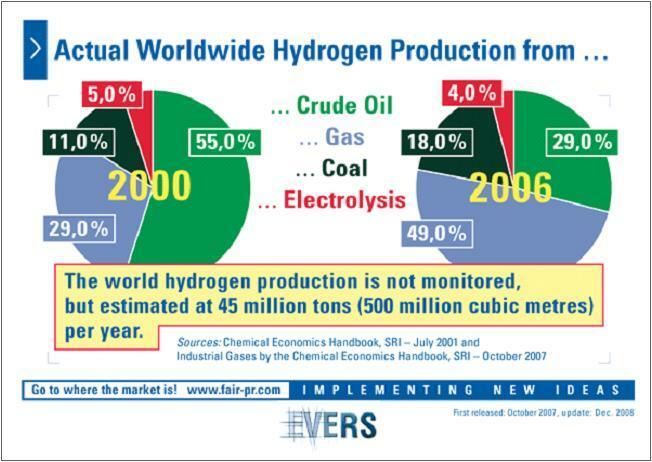 Hydrogen production is already a large and growing industry. Although the world hydrogen production is not monitored, but based on various estimates, it is around 45 million metric tons a year, with about 20-25% produced in the U.S. The historical growth rate is estimated to be around 10% per year. As of 2005, the economic value of all hydrogen produced worldwide is about $135 billion per year. Currently, global hydrogen production is 48% from natural gas, 30% from oil, and 18% from coal; water electrolysis accounts for only 4% (see Graph). Over 95% of the hydrogen in the U.S. is made from natural gas. Each year, the United States uses more than 9 million tons of hydrogen, 7.5 million tons of which are consumed at the place of manufacture. The remaining 1.5 million tons are considered to be "merchant" hydrogen, or hydrogen that is sold. Today, most of this hydrogen is used as a chemical, rather than a fuel. As hydrogen moves from these large industrial uses to something that you and I commonly use to fuel our businesses, homes, electronics and vehicles, other resources besides natural gas are expected to be used. The recent proposal by the Pickens Plan to switch heavy trucks to natural gas is a step toward hydrogen as it puts gaseous fuels into common usage. A natural gas truck system can also run on hydrogen fuel with different storage tanks. In addition it is really the only readily available alternative fuel for the freight transportation sector since electric or fuel cell truck technology will take longer to come to market compared to passenger cars. Most countries currently reliant on fossil fuels are investing heavily in hydrogen development programs. For example, several years ago, the Indian supreme court mandated that all public vehicles in Delhi, should be converted to run on compressed natural gas (CNG) as a means to fight the rising pollution problem. Currently, in India, five major auto makers, Tata Motors (NYSE:TTM), Bajaj Auto, Mahindra & Mahindra, Ashok Leyland and Eicher Motors, are collaborating in a project to create an optimal mix of hydrogen and compressed natural gas (CNG). The hydrogen blend will reduce NOx and particulate emissions by about 50%. The hydrogen is four times the cost of CNG but has three times the specific energy, so the improved mileage is expected to mitigate most of the cost. Hydrogen does have the same issue as the CNG sector, i.e., the lack of transporting, distributing and storing infrastructure, as described in my article - Investing in the Picken’s Plan, One Year Later. In addition, hydrogen has another major challenge - generating enough electricity without using more fossil fuels to produce the product. Nonetheless, hydrogen is one of the more developed sub-sectors within the green tech sector, and could potentially offer faster returns on investment as it is most likely to be widely adopted. Although hydrogen seems well positioned to ride the green wave, in the current environment, it is more prudent to capture the potential upside of the sector with the more established and diversified players like Royal Dutch/Shell (RDS-B), General Electric (NYSE:GE) and Siemens (SI) as opposed tothe small pure players like Hydrogenics (NASDAQ:HYGS) and FuelCell Energy (NASDAQ:FCEL).